Inside the T-Mobile branded retail box of the Samsung Galaxy S Blaze 4G, you will find a charger, a microUSB cable, as well as a SD adapter for the 4GB microSD card, which ships with the phone. The latter is already inserted in the device. While a pair of headphones would have certainly been a welcome sight in the box, we can't help but appreciate the presence of a microSD card in the retail package. After all, the recent trend on the U.S. market is for both items to be missing. There are barely any surprises regarding the design of the Samsung Galaxy S Blaze 4G. 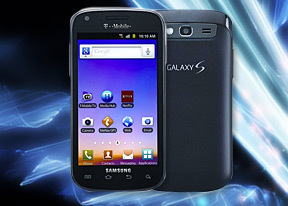 Like we mentioned to you earlier, the device looks like a mini version of the T-Mobile Galaxy S II. Things get a bit more interesting on the back of the smartphone. With the metal bezel on top, it looks a lot like a BlackBerry Torch 9860. Thankfully, the massive "Galaxy S" logo quickly disperses any berry related associations. The only color scheme offered for the device at the moment is black. Build quality is solid as always. The smartphone is a blend of high quality plastic and metal. Like all Android smartphones made by Samsung, the Galaxy S Blaze 4G looks like it can take a daily beating with ease. The measures of the Samsung Galaxy S Blaze 4G are one of its strong points. They are 121.7 x 62.9 x 11.2 mm, while the device's weight is 127 grams. The 4" Super AMOLED screen with WVGA resolution is more than just a familiar sight by now. It is featured in quite a few Samsung devices for a good reason - its contrast ratios and viewing angles are still among the best in the business. Unfortunately, we cannot say the same about the display's PenTile matrix. It lowers the screen's perceived resolution to a point, where you can see the actual pixels without trying too hard, thus seriously hampering the smartphone's upmarket-ish ambitions. Above the screen is where the earpiece, the usual set of sensors, as well as the front facing camera are located. Below it you have the ubiquitous for all U.S. Samsung droids, four touch sensitive buttons. The volume rocker, along with the latch for removing the battery cover is located on the left side. On the right, you will find the power/lock key, as well as the hot swappable microSD card slot. The 3.5mm audio jack of the handset sits lonely at the top. The microUSB port and mouthpiece reside at the bottom. The 5MP camera, its LED flash, the loudspeaker grille, as well as a "Galaxy S" logo are sitting at the top of the device's back. There is a miniscule chin at the bottom. Under the battery cover, there are no surprises. The SIM card is hot swappable. The 1750mAh battery has NFC talents to go with its usual duties. 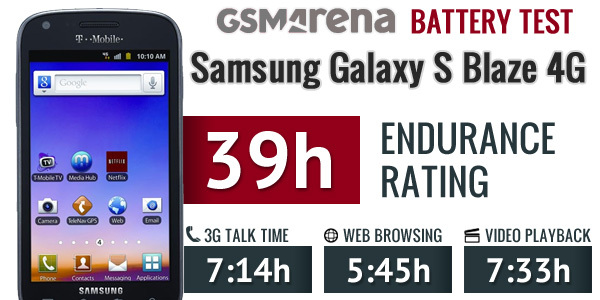 The Samsung Galaxy S Blaze 4G achieved an endurance rating of 39 in our battery test. This means that you will need to recharge your device every 39 hours if you use it for an hour each of telephony, web browsing, and video playback every day. While the handset is by no means a record breaker battery performance wise, it will easily make it through a full day of normal use. You can find out all about the battery test of the Samsung Galaxy S Blaze 4G here. Handling the Samsung Galaxy S Blaze 4G is a pleasure. The 4" screen allows a hassle-free one handed operation when necessary. The back has a fine and grippy texture to it, so accidental drops are not likely. There were absolutely no surprises about the design and build quality of the Samsung Galaxy S Blaze 4G, save for the design slip with the device's back. It is solidly put together and easy to operate. The screen however, could have been way better. It is now time to take a look at the software of the device.